It’s the most wonderful time of the year…Happy Holiday 2016! Just about every headlining artist seems to have recorded at least one Christmas album at some point. That’s good for the festive CD collector, including those of us collecting early pressings. 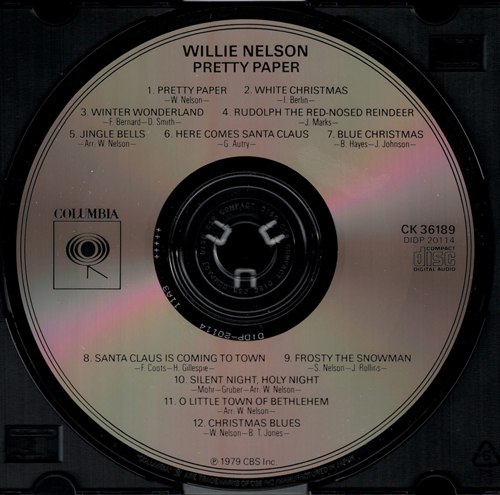 Country legend Willie Nelson made his holiday contribution in 1979 with the 12-track collection titled Pretty Paper. 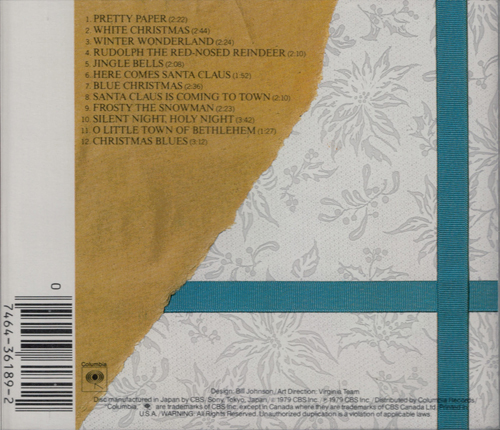 The album is best known for the title track, but it includes many other excellent interpretations of Christmas classics, including “White Christmas”, “Jingle Bells”, and “Silent Night, Holy Night”. Pretty Paper was originally released by Columbia Records on vinyl, cassette, and 8-track tape. Roundabout 1984, Pretty Paper debuted in the U.S. on CD under Columbia catalog number CK 36189. The first CDs of Pretty Paper to hit the shelves in the U.S. were pressed in Japan by CBS/Sony. Typical of an early U.S. Columbia (CBS Records) issue, the inserts for Pretty Paper state “Disc manufactured in Japan by CBS/Sony, Tokyo, Japan”. Also typical of U.S. CBS releases, this Japan statement was retained on inserts accompanying later U.S. pressings, which often causes confusion among buyers and sellers. It should be noted that U.S. pressings of Pretty Paper are commonly, but not always, found with the statement “Now Made In The U.S.A.” printed next to the barcode on the back insert. To cause further confusion, the earliest U.S. DADC pressings can be found with a back insert that lacks the “Now Made In The U.S.A.” statement. With U.S. CBS releases, always study the disc to determine where the disc was made. In many cases, the disc will say where it was made. Otherwise, refer to the matrix code to identify the pressing plant and to get an idea of when the disc was pressed. Now, back to the Japanese pressing of Pretty Paper. As noted above, the Japanese pressing of Pretty Paper was produced by CBS/Sony. “MANUFACTURED IN JAPAN” is printed along the perimeter at 6 o’clock. The particular copy featured here has “CSR COMPACT DISC” repeating in the clear plastic ring at the center, and the matrix code is “DIDP-20114 11A3 +++++”. Minor variations can be found in the matrix code. As an example, another Japanese pressing in my collection is slightly earlier and bears matrix code “DIDP-20114 11A1”. With the exception of the matrix codes, the two copies are identical. The Japanese CBS/Sony pressing of Pretty Paper is quite rare in my experience. If you cannot locate a copy in short order, later U.S. pressings under catalog number CK 36189 and a budget reissue are readily available. Get yourself a common disc and enjoy the music this holiday season. Shown below are the cover and back insert for Pretty Paper, as well as the Japanese CBS/Sony pressing. 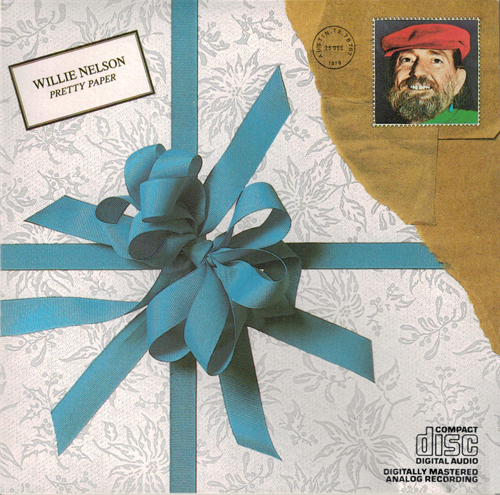 The cover artwork for Willie Nelson Pretty Paper (Columbia, catalog number CK 36189). Different cover artwork was used for a budget reissue CD. The back insert for Willie Nelson Pretty Paper (Columbia, catalog number CK 36189). Note the text “Disc manufactured in Japan by CBS/Sony, Tokyo, Japan” along the bottom. As this back insert accompanies an early Japanese CBS/Sony pressing, it does not have the “Now Made In The U.S.A.” statement printed next to the barcode. This statement fills the white space for later copies pressed in the U.S. The Japanese CBS/Sony pressing of Willie Nelson Pretty Paper (Columbia, catalog number CK 36189). Although difficult to see in this picture, the disc has “MANUFACTURED IN JAPAN” printed along the perimeter at 6 o’clock. Also, the disc has “CSR COMPACT DISC” repeating in the plastic ring at the center, and the matrix code is “DIDP-20114 11A3 +++++”.